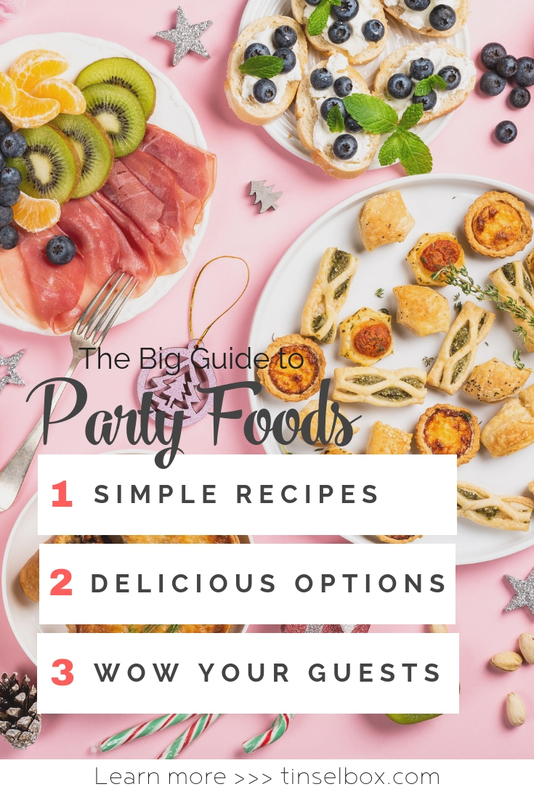 Planning your party foods and recipes is exciting, but it can also become daunting once you start to consider the varied tastes and diets of your guests. 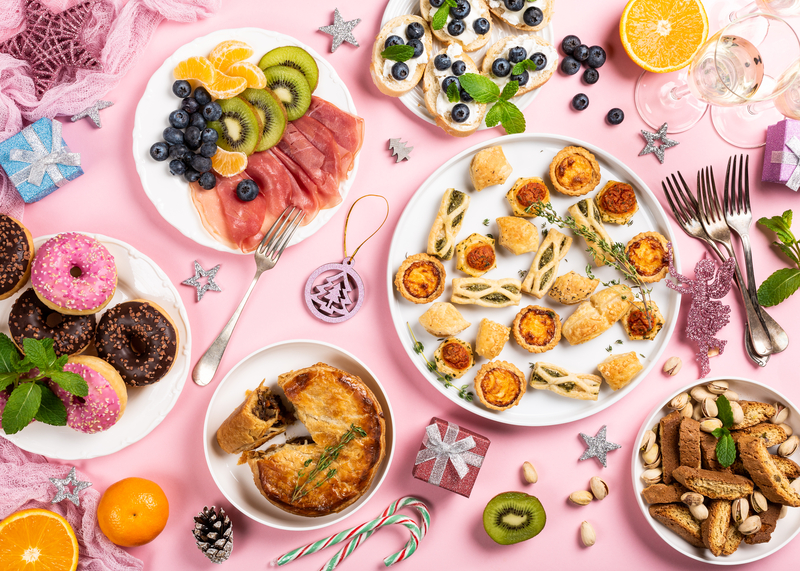 Tinselbox is here to help make planning for your party food planning easier, even inspiring, and help you leave a lasting memory for your guests. You may be wondering, “What food do you serve at a party? What foods do you avoid?” That’s, easy. Delicious party foods are my specialty! I choose foods and recipes that WOW without all the fuss and mess. 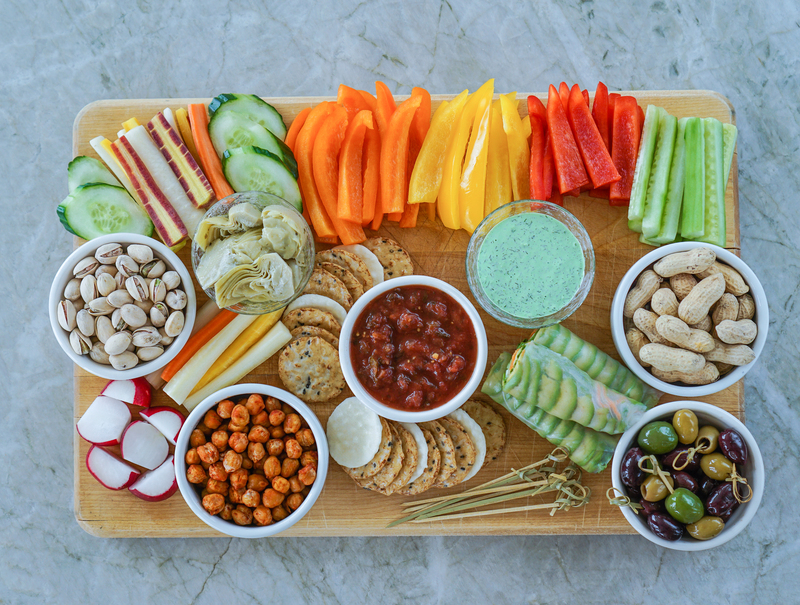 I have a few go-to’s that never disappoint, including crudite platters with cheese, crackers, olives, fruit and more. Serve these on a giant platter so that your guests can pick and choose to their taste. I love these because I can include foods that delight children and meet different dietary needs. Plus they look beautiful and are no fuss to create. Pro Tip: you can add Tomato Mozzarella skewers and prosciutto melon to the mix as well. What to AVOID: Anything fancy that you have never made before. I have so tried so many times to make something new and created a huge pinterest fail. Right before a party, you do not need that kind of stress. Many of your food and recipe decisions will depend on the number of guests you expect. Small groups (6-10 people) can be a sit-down meal and include some foods that take more time to prepare. Make your favorite family casserole or go all out with a great theme. Themes I love for a dinner party: Comfort foods, Taco Night, Tapas and Fondue Night. For large parties (20-35 people) prepare food platters, including veggie platters, chicken skewers, big lasagnas, pizza (delivery is great), a thinly sliced trip tip or a giant pot of posole. Make a few fancy appetizers for the show of it, if you feel generous. 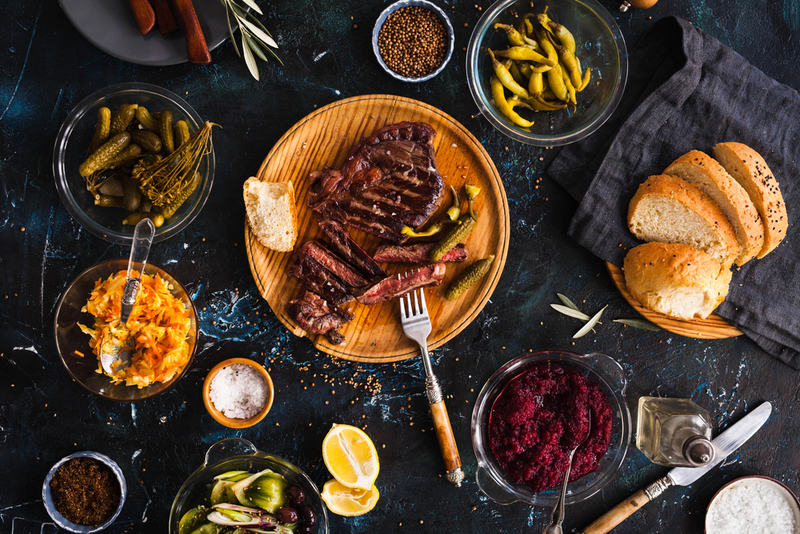 If your party is in that middle range, with 10-20 guests, go with BBQ foods, like ribs, chicken, bread, salad and fruit salad. So easy and delicious for everyone. For really big gatherings (35 – 100+ people) I serve pizza, salad with lots of drinks to share. The pizza is grab and go and pleases most palates. It can be eaten standing up as well because I know my house does not accommodate 100 people to sit down. On the invitation, you will specifically note that it is a pizza night, so those who cannot eat it will come aware. If children are attending any party make something all the kids will like. Make sure you count the kids and plan for a serving each. Most universal kids foods I have found are chicken nuggets, pizza or macaroni, and cheese along with fruit and carrots. First of all, you can’t prepare for all the special diets out there, from Veggie to South Beach to Keto to Paleo, not to mention allergies and other digestive issues. So don’t stress it, but do a little planning. If your party is small, ask the guests questions about their diets and plan appropriately. Many RSVP systems allow you to gather this information. If your event is large, serve a large veggie platter and an all-meat dish like chicken skewers. With those two plates, you’ll have most of those special diets covered. One thing to understand is that people with special diets are used to being a little disappointed at events like this. With just a little effort, they’ll find some good eats and be truly grateful. For your office potluck, you should always prepare something. So many people opt to swing by the grocery store on the way. Trust me, people will notice your effort in bringing a specially made dish. It can also save you money if you try. Think brownies or cookies if you are short on time. Get the box of brownies for $5, bake ‘em and impress everyone. We love to make our Lemon Orzo Salad or this Asian Fusion Pasta Salad from Ina Garten. Skewers are the best (and cleanest) finger foods, with their built-in utensils. Meatballs are an absolute fave on a toothpick — you’ll see you guests standing by the meatballs, eating away. If you want to serve salad or fruit salad, place servings in little cups. Bruschetta on crusty bread, taquitos, and deviled eggs are always a hit as well. Fortunately for you, I have first-hand experience with budget party planning! Chicken thighs feed lots of people on a small budget, so you can spend $20 and feed countless people with those. Chicken posole and chili with fixins are also great on a budget. For Easter one year, we did brunch with a ham, pancakes, french toast, bacon and eggs — all for less than $50! You can keep a big family like mine happy with big flavors and lots of great food. How many adults, and how many children, will there be? Children will eat simple foods, so plan for that (but don’t forget the seating!) You might also consider letting the kids eat first, cleaning that up and then serving adults. Do you have enough seats to seat everyone down inside? If so, think cozy dinner, lasagna and a food buffet to share. Will you be seating people outside? Consider BBQ with drinks! If it’s a large outdoor dinner or lunch, prepare a combination of sit down and portable foods. Everybody won’t need a serving and people will rotate sitting down. Put a recycling bin out so they can throw away their own trash after they eat. Will this be an event where people walk around and eat? Make everything portable. Again those finger food can be a great option. Time of day is important as well. If your party overlaps these time frames, you will want to be clear to your guests about your food plan. If you are not providing a whole mean avoid these times! You see, planning food for your party can be simple — don’t stress! The ideas here are simple enough to prepare and will help your party create lasting, fun memories. With just the right planning and some easy recipes, your party food will be a great success. This is a hugely useful resource to all of us who love to cook but aren’t so sure we can pull off a party! THANK YOU! What a wonderful collection of truly great ideas. We live in ski country in the mountains at Lake Tahoe, and do a lot of entertaining. We don’t have a lot of restaurants in the area, so we tend to entertain in each other’s homes, and dinners for 10 – 16 is the average size party. We all do pot lucks. And we have a lot of weekend guests with all kinds of dietary needs. Long story short, this is a great resource for me!! Thank you!!! I’d love to check it out!! Really amazing!